Now that Memorial Day weekend has passed and the warmer weather seems to be here at last, many small grains fields are ready for their herbicide application. As always, the question arises, should I include a fungicide as good insurance against leaf disease and what should I spray? In Minnesota it helps to think of fungicide decision making in broadly three time categories. Spraying at this time does not necessarily protect you through the entire season until the late application for FHB, as many diseases can come in the crop at any time. Spraying when there is no real disease on the crop can provide selection pressure for the disease to become insensitive to the fungicides (Many diseases also survive on grassy weed species in ditches etc. even if they are not affecting the crop itself). However, if disease is present, then it is worth thinking about spraying. Early diseases to look for in Minnesota include Tan spot, Septoria spot blotch, Leaf rust and Stripe rust. Good early season fungicides to use would be something with propiconazole (e.g. Tilt). It provides good control of most disease, is relatively inexpensive and a second season application can be made if necessary for mid-season disease control. A mid-season spray encompasses any diseases appearing in the time between the five leaf stage and flowering. At this point, the main goal is to protect the emerging flag leaf from becoming covered in disease, as this provides most of the energy for grain filling. If you have disease high in the canopy (leaf rust, stripe rust, tan spot, Septoria spot blotch etc.) as the flag leaf is starting to emerge, then a fungicide application is appropriate. A number of products can be used at this stage. Consult the NCERA 184 Small Grains fungicide efficacy table for a guide to active ingredients and their efficacy for different diseases. At this time, do not use Prosaro and Caramba, as these are better deployed for control of FHB. In addition, we do not advocate the use of strobilurin fungicides (such as Headline), as it may elevate the level of mycotoxin production after FHB infection. Early flowering (Feekes Growth Stage 10.5.1 or early anthesis) applications are solely designed to control FHB. A spray application should be made when 50 percent of tillers are at early flowering (early flowering is often referred to as Feekes growth stage 10.5.1). If you can use a back and forward angled nozzle (70 and 30 degrees) you will gain far better penetration of the fungicide in to the head and therefore better disease control. Flowering begins in the center of each head with small yellow anthers protruding. Flowering then proceeds both up and down the head from the center. This usually lasts 3-4 days only and will be faster if the weather is warm. The anthers turn white (die to the release of the yellow pollen known as dehiscence) and quickly drop off the plant. In order to see if a head has already flowered, open up the spikelet in the center of a head and see if there are immature green anthers inside. If yes, the head has not flowered. If not, the head has already flowered and the anthers have fallen away from the plant. As the plant becomes closer to flowering, these green anthers will start to color up inside the spikelet. To control FHB, two fungicides, Prosaro and Caramba have consistently been shown to reduce both FHB and also the level of the mycotoxin, DON, produced by the fungus. These products are a little more expensive, but if planting in to previous corn ground, or growing a moderately susceptible variety and the risk of FHB is high, then it can pay off. If the risk of FHB is trending low and you are growing a moderately resistant variety, you may opt to use a slightly cheaper tebuconazole product. As with many aspects of farming, it is a balancing act weighing risk verses gain. The link to the FHB risk forecasting map to help you determine your level of risk as plants start to flower is: http://mawg.cropdisease.com for the Minnesota Model and http://www.wheatscab.psu.edu for the national model. You can also sign up for text alerts for the commentary on FHB risk that I and other scientists will provide throughout the season on these sites. 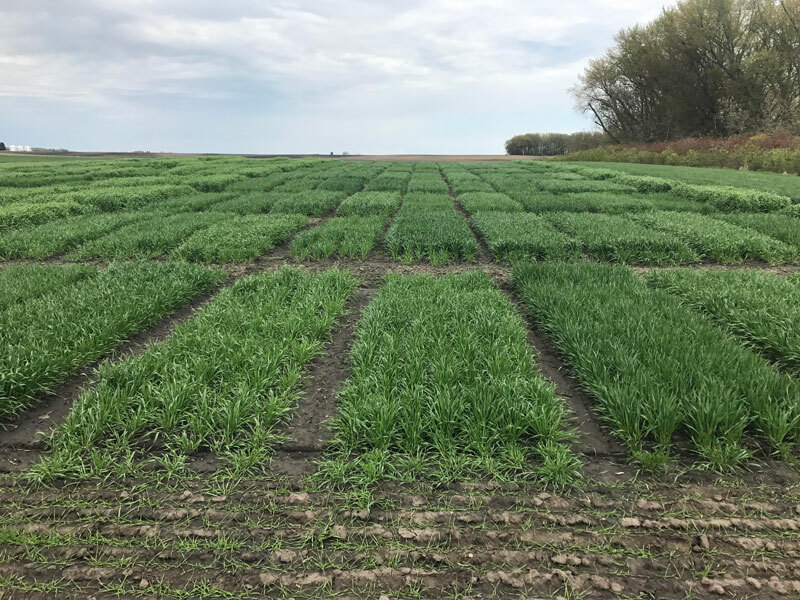 The Minnesota Association of Wheat Growers website also has a link to a leaf disease forecasting model which you can use to assess mid-season risk of leaf diseases. The Spring wheat variety trials bulletin (along with variety trials bulletins for other crops) can be found at https://www.maes.umn.edu/publications/field-crop-trials and, along with other agronomic traits, will list disease susceptibility information for the main small grains diseases in Minnesota for each variety.